TNPSC VAO Exam Question & Key Answer for 2014 Available now. TNPSC VAO Exms Basics of Village Administrator Officer Post. TNPSC means Tamil Nadu Public Service Commision. This tnpsc will conduct many exams in various department for tamilnadu government staffs recruitment. 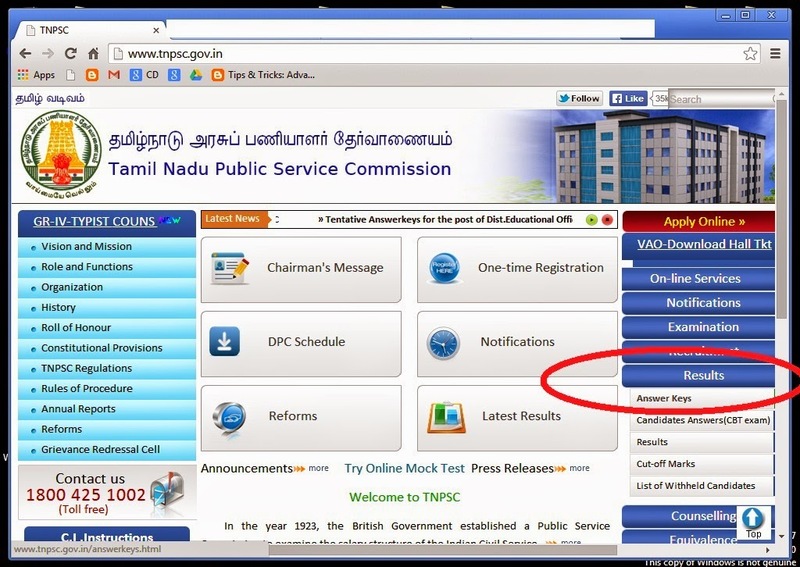 TNPSC'S Official Websites www.tnpsc.gov.in or www.tnpscexams.net. If you want tnpscvao exam keyanswer kindly go to tnpsc official website - Please see right side bar Results -> Answer Keys -> VAO Exam Answer Key -> Exam Date: 14.06.2014 -> VAO Exam Tentative Key Answer . http://www.tnpsc.gov.in/answerkeys.html this is a direct link for tnpsc vaotest tentative keyanswer direct link. There are 2342 Vacancies to be fill up via this VAO Exam.